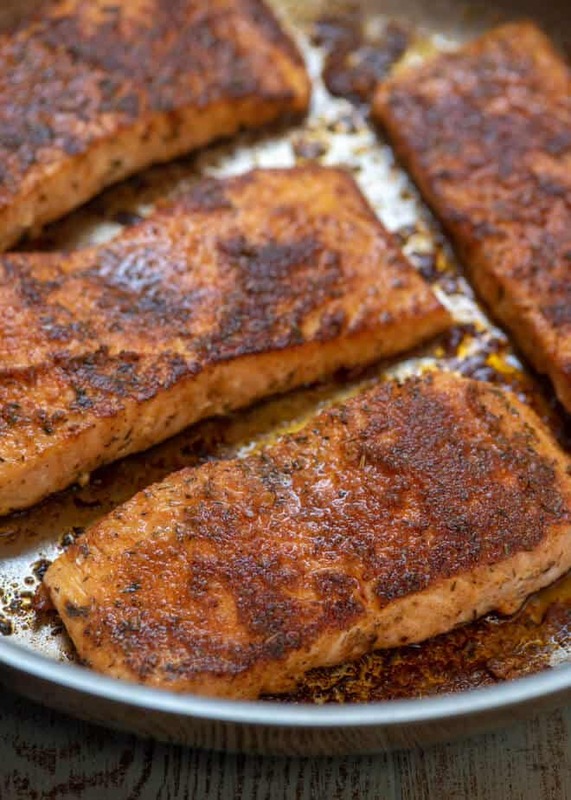 A homemade Cajun seasoning mix adds amazing flavor to this Blackened Salmon. A restaurant quality meal that is quick and easy enough to make any night of the week. Hey there! I hope you’re all having a good start to this new year. I was watching the Today Show last week and they announced that it was Quitter’s Day, otherwise known as the day that most people give up their New Year’s Resolutions. Day 11? Wow! And here I always thought people gave up on Super Bowl Sunday when all those cheesy dips are just sitting there begging us to dig in. But, nope. Apparently the majority of folks ditch those big health and fitness related goals in less than two weeks. But, I get it. I have to eat what feels right and that can’t be forced. 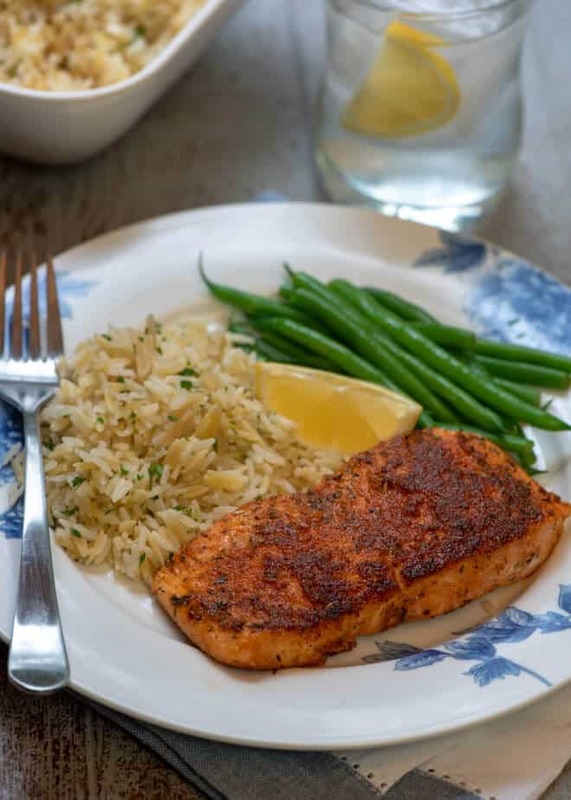 The good news is that wholesome, nutritious food can be delicious and this Blackened Salmon is proof positive of that point. My family is seriously crazy for this meal and I crave it on a regular basis. 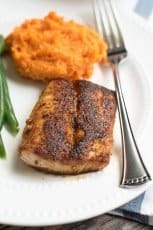 My recipe for Blackened Mahi Mahi that I published a few years back has become one of the most popular recipes on Valerie’s Kitchen and since I frequently cook salmon in the same fashion, I thought I’d share this healthy meal idea with you. 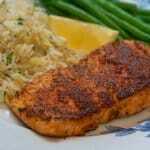 It’s cooked quickly and easily and is ready to serve in under 20 minutes. You can’t beat that! 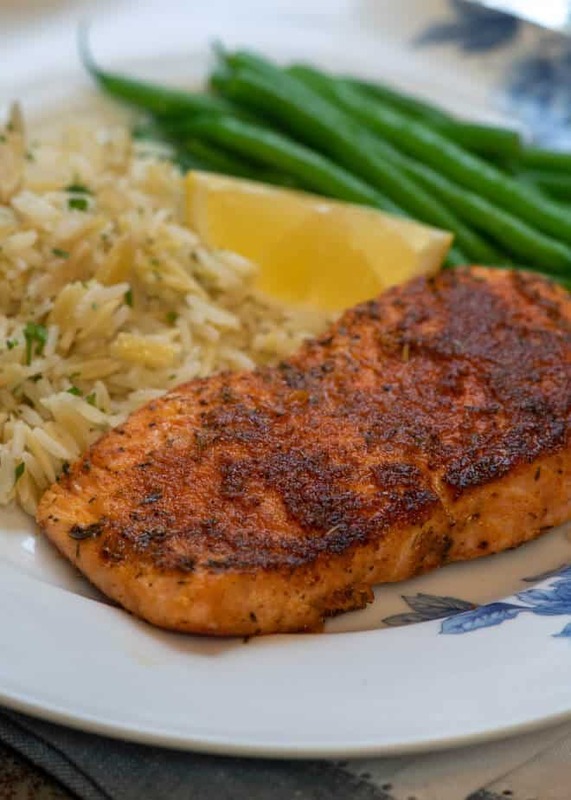 You want to pick up skinless salmon fillets for this cooking method so that both sides of the fish can be coated with the spice mix. I have big love for the frozen fish available at Costco. It is incredibly fresh and very high quality. 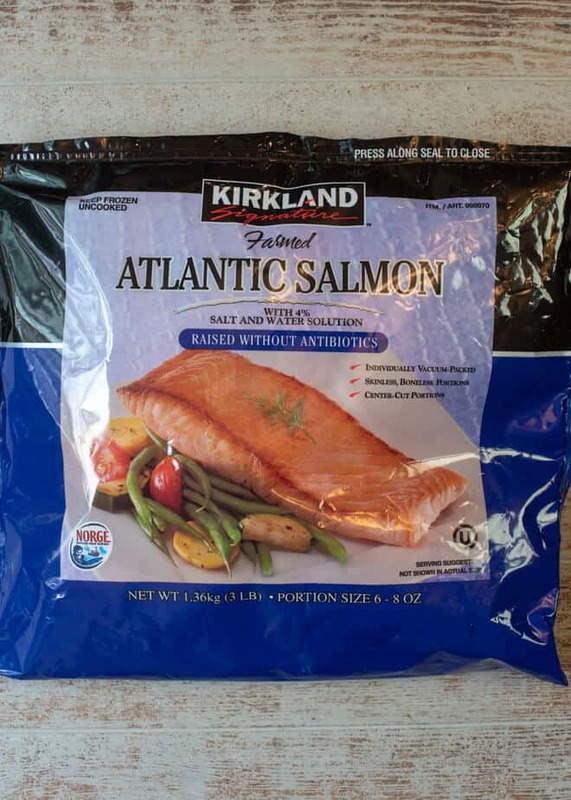 I’ve purchased Costco’s fresh fish in the past and the bagged, frozen variety is even fresher than fresh, if that makes any sense. 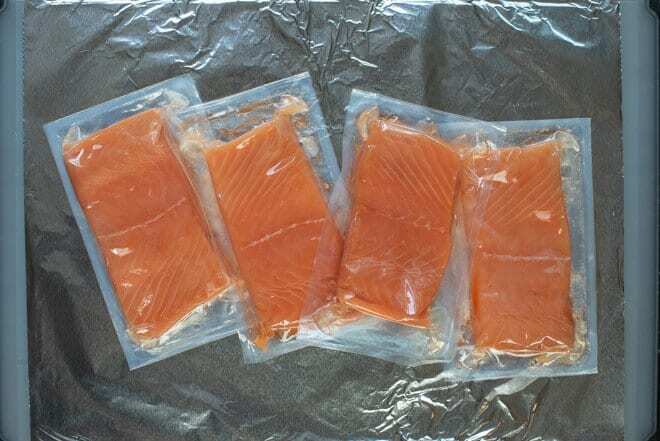 Inside this bag you’ll find vacuum sealed individual portions of beautiful skinless Atlantic salmon. You can thaw just the number you need and keep the rest frozen for another time. A very good value and so convenient. 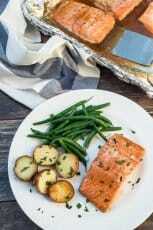 If frozen, your salmon will need to be completely thawed overnight in the refrigerator before beginning. I like to work on a foil lined sheet for easy clean up. 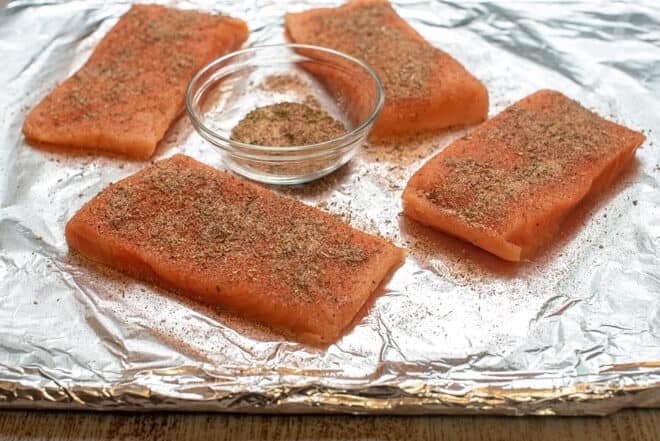 Blot the salmon with paper towels to dry it and then coat both sides with my Kickin’ Cajun Seasoning Mix. The recipe card below includes the amounts needed to create just enough of the spice mix to coat four fillets but I always mix up a big batch to have on hand. Plus, I rarely only cook four of anything, ever, so a big batch it is. 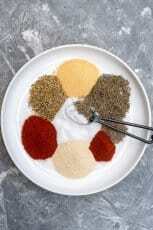 You can easily control the level of spiciness by either reducing or increasing the amount of cayenne pepper. As written it reaches what is the perfect level of heat for me – it’s got a kick but I can totally handle it. 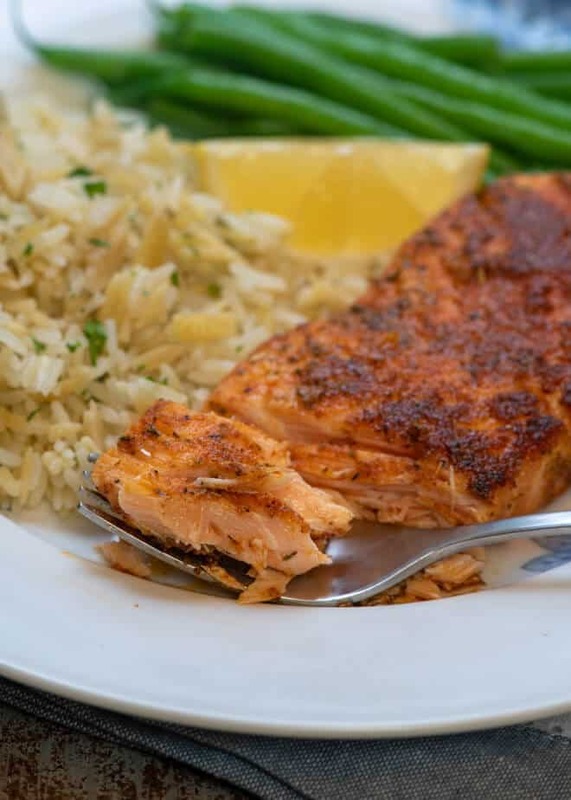 The salmon cooks up quickly in a very hot pan on the stove. Cast iron is always a great choice but I most often turn to my Calphalon Stainless Steel Everyday Pan for getting that nice crust on blackened fish. Depending on the thickness of your fillets the cooking time can vary a bit but should not take more than about 4 minutes per side. 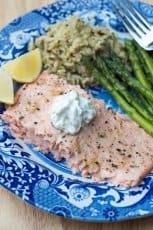 An easy way to tell if the salmon has cooked through is to insert a sharp knife into the thickest portion of one of the fillets and take a peek at the inside. It should not look raw in the center but instead be just very slightly translucent pink. At this point you can remove the skillet from the heat and squeeze fresh lemon juice over the top of the fish. I like to serve it with my Almond Rice Pilaf and steamed green beans and even my biggest, hungriest guys here love this meal! Pat fillets dry with paper towels. Season the fillets liberally with spice mix on both sides, pressing it into the fish with your hands. Wash hands thoroughly. Place a large sauté pan over medium-high heat and add butter and oil. When the fat is nice and hot, add the seasoned fish. Cook, undisturbed, for several minutes, until golden brown on one side. Flip fish over and continue to cook until completely cooked through.